Squaw Valley 4 is located at 'snow sure' altitude at the top of Plagne Villages (2100 metres) above the ski lifts (you ski down to the lifts). Our ground floor apartment has a terrace and bench a few paces from the slopes and you can ski back to the door. Mainly North facing slopes guarantee superb skiing from December to the end of April. A well equipped apartment providing all the facilities for an excellent skiing holiday. In the summer there are varied sporting activities available including skiing, mountainbiking and alpine walking. La Plagne boasts France's largest single ski resort and now with the link to Les Arcs probably the largest interlinked ski area in the world. In the last five years we have developed a good working knowledge of La Plagne and over half of our bookings are from previous guests. The apartment is comfortable and well equipped (including for example, a DVD and video library). La Plagne is well suited to self catering holidays with numerous supermarkets and shops. The skiing varies from wide and easy boulevards to testing glacier and off piste skiing. In summer La Plagne provides an excellent holiday base with summer skiing, tennis, swimming, walks in the Vanoise and rafting on the Isere. Travel: Easily accessible by car being about 620 miles from Calais: about 8 to 9 hours driving time. There is free open parking near the apartments. Geneva, Grenoble or Chambery are the most convenient airports to La Plagne and there is a coach or train transfer. Lyon is about the same distance and has train connections to Aime. Caretaker: We have a local English caretaker who will resolve any problems with our apartment. They will be your point of contact if something goes wrong. We do not employ a cleaner and ask that our guests leave the apartment clean and tidy for the next guests. At the end of the rental period our caretaker will arrange to visit the apartment and ensure that the apartment is ready for the next guests. We first rented this apartment, then bought it because of the fabulous location, great views of the mountains and the warmth that comes through the window from the Suns rays. So whether you want to ski or sit and relax it is the perfect spot. Centrally controlled under floor heating. I think this is about our 10th stay at Squaw Valley. My wife and I really appreciate the location, it is perfect ski in / out and being at over 2000mts has always been snow sure. The layout and size of the apartment is ideal for us and combined with the location of the Ski Rental shop and the bus stop for the free 'Navette' bus down to the centre of Plagne Villages makes it perfect. We will certainly be trying to book again for next season. It's great that people keep coming back, we are delighted that Ian and Naomi appreciate all the great attributes of our apartment and hope they continue to return.It's always good to see people re booking. Many thanks. We have skied from this apartment for approx 6 holidays and it never ceases to exceed all our hopes and expectations. It is truly ski in / out. The new Kitchen is a real bonus and the fact that the Bergerie restaurant is approx 250mts from the door means we can stop of at the end of the day for a quick drink! And then ski to the door. We are delighted that Ian and Naomi enjoy our apartment as much as we do. The apartment is fantastic. Nothing too fancy but a great video collection to pass evenings with. Ski home every evening and you can get fresh bread every morning at the ski shop. Perfect place if you and your family members can ski, as you just ski in and out of the place and can get Plagne Centre in no time. You get very good accomodation conditions for the price. Furthermore, the agent staying in the area is very helpful if you have any doubts or need to get ski passes (ours were waiting on the table when we arrived). The pile of movies available to watch in the apartment is amazing !! If we do not decide to go next year in bigger group, I would definately get back to this place. Thank you . The location of this apartment was excellent, plenty of space for playing outside - safe away from main slopes and ski in ski out with easy access to the whole area. Apartment was well equipped with plenty of storage space, during our stay our 9 year old daughter was poorly and couldn't ski - the hundreds of DVDs and videos along with the great family games like scrabble and monopoly kept us entertained. Our property is the highest apartment in Plagne Villages. 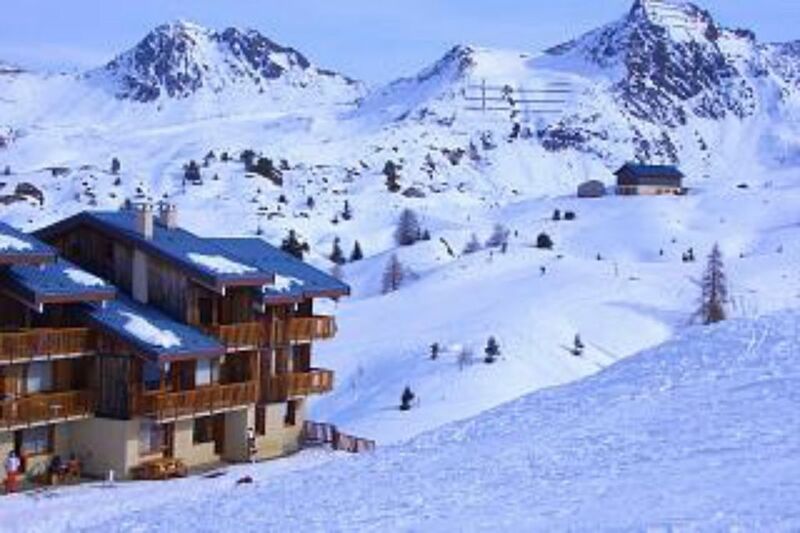 Plagne Centre is a short bus ride away, and Plagne Bellecote is a further 10mins by bus. Easy access is available to the whole of the Paradiski area. Ski: With the super fast link lift to Les Arcs the combined ski area - 'Paradiski' - now boasts the largest linked ski area in the world. Need we say more? Tourist tax will be collected by our caretaker (1.09 Euros per person).